(AllHipHop News) In a moment of extreme humor, a man challenged T.I. to an "anti gravity hat off" battle. The man, Krieg LaFlare, hit Tip on Twitter and told the "king of the South" that he had 24 hours to reply or forfeit. He subsequently posted a picture of his hat cocked all the way to the side so far that it should have fallen off his head. 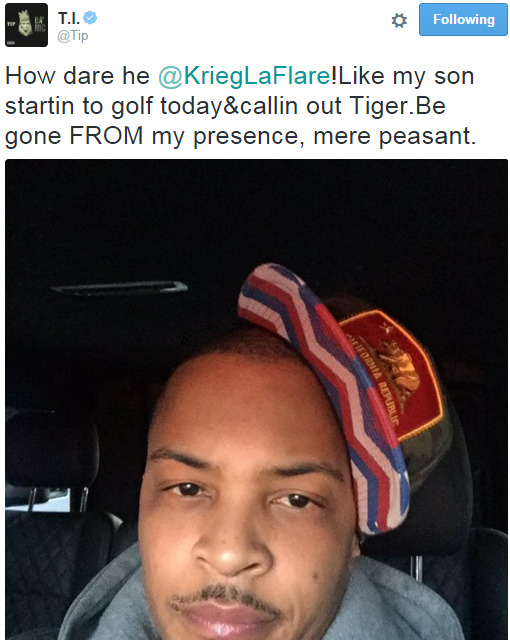 Tip did indeed respond with his own image and proclaimed victory. However, Krieg LaFlare did not agree tweeting, "B**ch he lost!"